The complexity of the motion increases when we need three dimensions to describe the motion. There are many different ways to describe motion in three dimensions. One common method is to describe the motion of the center of mass (in a fixed coordinate system) and to describe the motion of the components around the center of mass (in the rotating coordinate system). 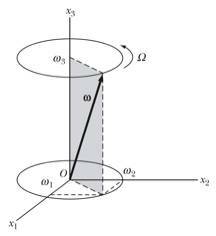 If we assume that the rotating frame is fixed to the rigid body, then vr = 0. The second term is zero, if we choose the origin of the rotating coordinate system to coincide with the center of mass of the rigid object. · The tensor is symmetric: Iij = Iji. Of the 9 parameters, only 6 are free parameters. · The non-diagonal tensor elements are called products of inertia. · The diagonal tensor elements are the moments of inertia with respect to the three coordinate axes of the rotating frame. 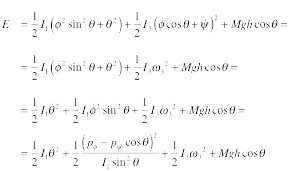 This equation clearly shows that the angular momentum is in general not parallel to the angular velocity. An example of a system where the angular momentum is directed in a different from the angular velocity is shown in Figure 1. Figure 1. A rotating dumbbell is an example of a system in which the angular velocity is not parallel to the angular momentum. The axes for which the non-diagonal matrix elements vanish are called the principal axes of inertia. This requirement leads to three possible values of I. Each of these corresponds to the moment of inertia about one of the principal aces. Find the inertia tensor, the principal axes, and the principal moments of inertia. We note that the principal axes are mutually orthogonal, as they must be. which shows the principal axes are orthogonal. In our discussion so far we have assumed that the origin of the rotating reference frame coincidence with the center of mass of the rigid object. In this Section we will examine what will change if we do not make this assumption. Consider the two coordinate systems shown in Figure 2. One reference frame, the x frame, has its origin O coincide with the center of mass of the rigid object; the second reference frame, the X frame, has an origin Q that is displaced with respect to the center of mass of the rigid object. Figure 2. Two coordinate systems used to describe our rigid body. This relation is called the Steiner's parallel-axis theorem and is one example of how coordinate transformations affect the inertia tensor. It turns out that for any inertia tensor we can find a rotation such that the inertia tensor in the rotated frame is a diagonal matrix (all non-diagonal elements are equal to 0). We thus have seen two different approaches to diagonalize the inertia tensor: 1) find the principal axes of inertia, and 2) find the proper rotation matrix. Perform a rotation of the coordinate system by an angle q about the x3 axis. 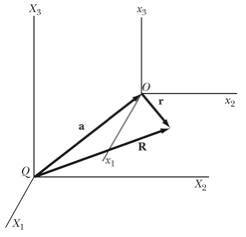 Evaluate the transformed tensor elements, and show that the choice q = p/4 renders the inertia tensor diagonal with elements A, B, and C.
Any rotation between different coordinate systems can be expressed in terms of three successive rotations around the coordinate axes. When we consider the transformation from the fixed coordinate system x' to the body coordinate system x, we call the three angles the Euler angles f, q, and y (see Figure 3). Figure 3. The Euler angles used to transform the fixed coordinate system x' into the body coordinate system x. With each of the three rotations we can associate an angular velocity w. To express the angular velocity in the body coordinate system, we can use Figure 3c. · wq: Figure 3c shows that the angular velocity wq is directed in the x1''' - x2''' plane. Its projection along the x3''' axis, which is also the x3 axis, is equal to 0. The angular velocity vector traces out a cone in the body frame (it precesses around the x3 axis - see Figure 4). The rate with which the angular velocity vector precesses around the x3 axis is determined by the value of W. When the principal moment I3 and the principal moment I1 are similar, W will become very small. 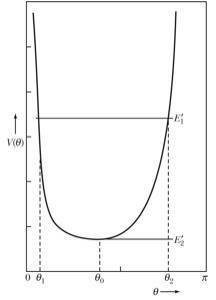 Since the angle between the angular velocity vector and the angular momentum vector must be constant, the angular velocity vector must trace out a space cone around the x'3 (see Figure 5). Figure 4. The angular velocity of a force-free symmetric top, precessing around the x3 axis in the body frame. Figure 5. 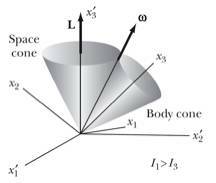 The angular velocity of a force-free symmetric top, tracing out a space-cone around the x'3 axis in the body frame. A symmetric body moves without the influence of forces or torques. Let x3 be the symmetry axis of the body and L be along x3'. The angle between the angular velocity vector and x3 is a. Let w and L initially be in the x2-x3 plane. What is the angular velocity of the symmetry axis about L in terms of I1, I3, w, and a? When the external forces and torques acting on the system are not equal to 0, we can not use the method we have used in the previous section to obtain expressions for the angular velocity and acceleration. The procedure used in the previous section relied on the fact that the potential energy U is 0 in a force-free environment, and therefore, the Lagrangian L is equal to the kinetic energy T.
These equations are the Euler equations for the motion of the rigid body in a force field. In the absence of a torque, these equations reduce to the force-free Euler equations. Figure 6. Spinning top with fixed tip. The effective potential becomes large when the angle approaches 0 and p. The angular dependence of the effective potential is shown in Figure 7. If the total effective energy of the system is E1', we expect the angle q to vary between q1 and q2. We thus expect that the angle of inclination of the top will vary between these two extremes. Figure 7. The effective potential of a rotating top. Since b has two possible values, we expect to see two different precession rates: one resulting in fast precession, and one resulting in slow precession. When the angle of inclination is not equal to q0, the system will oscillate between two limiting values of q. The precession rate will be a function of q and can vary between positive and negative values, depending on the values of the angular momenta. The phenomenon is called nutation, and possible nutation patterns are shown in Figure 8. The type of nutation depends on the initial conditions. Figure 8. The nutation of a rotating top. Investigate the equation for the turning points of the nutational motion by setting dq/dt = 0 in the equation of the effective energy. Show that the resulting equation is cubic in cosq and has two real roots and one imaginary root. which is cubic in cosq. V(q) has the form shown in the diagram. Two of the roots occur in the region , and one root lies outside this range and is therefore imaginary. We see that the perturbations around the x2 axis and the x3 axis oscillate around the equilibrium values of l = m = 0. We thus conclude that the rotation around the x1 axis is stable. We see that the first frequency is an imaginary number while the second frequency is a real number. Thus, the rotation around the x3 axis is stable, but the rotation around the x2 axis is unstable. Consider a symmetrical rigid body rotating freely about its center of mass. A frictional torque (Nf = -bw) acts to slow down the rotation. Find the component of the angular velocity along the symmetry axis as a function of time. 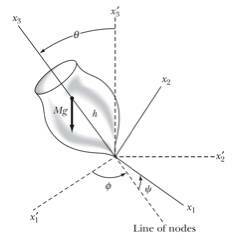 In this Chapter we focus on the dynamics of rigid bodies. In our introductory courses the motion of the rigid body is reduced to a two-dimensional problem. In this Chapter we will descibe the motion of a rigid body in three dimensions.